If you use an applicant tracking system to generate your job descriptions, chances are that you’re leaving a bunch of Google and other search traffic on the table because you’re neglecting to adhere to Schema.org. 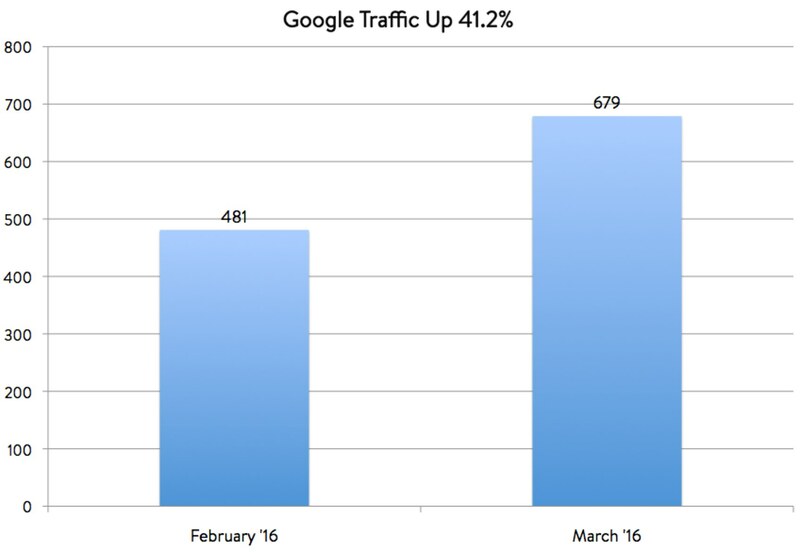 One client of ours saw an increase in Google traffic of 45% in the very first month they began adhering to Schema.org. Schema.org sounds like a weird “black-hat” type of movement, but it’s actually very legit and backed by Google, Microsoft, Yahoo and Yandex (the largest Russian search engine). 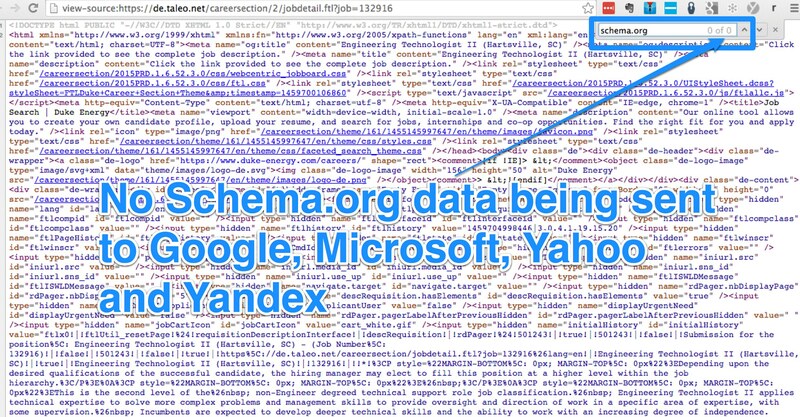 Schema.org launched in 2011 to try to get Web sites to send more structured data so that they can deliver a better experience for the user (the candidate in your case). Note: Schema.org is one of many elements of SEO (search engine optimization) and if you want free tips on SEO for job descriptions check our Ongig SEO page. For details of how to code your job description pages, check out Schema.org Job Descriptions. These are things you would find in nearly all job descriptions and Google et al want you to signal to them that you have these fields in your job descriptions. 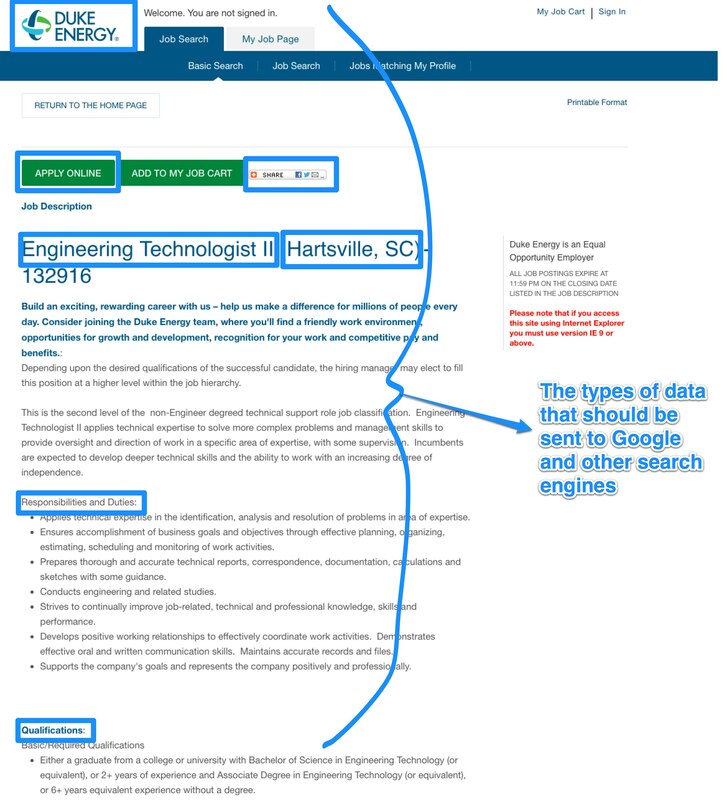 For example, below is a Duke Energy job description below and 7 examples of data points that they should be telling Google and the other search engines about. But when you look at the HTML of the Duke job description, as you can see below, there are no mentions of Schema.org meaning that Google will not consider this an official job description. 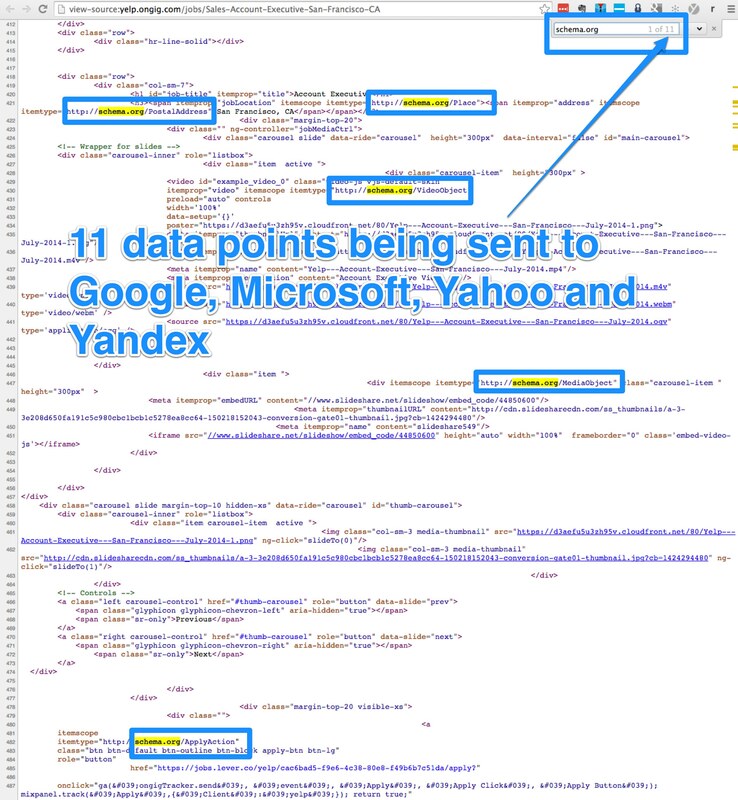 They’ll still send some traffic to it but not as much as if Duke adhered to Schema.org in the various fields of data. All other things equal, when a candidate searches for job opportunities then Google, Microsoft, Yahoo, Yandex and other search engines will more likely serve up the ones that adhere to Schema.org. Ask Your Applicant Tracking System — You can ask your ATS to do it (some do it already but most don’t). Ask Your IT/Tech Team — Your internal tech team can take care of this for you. Ask an Agency — If you’ve got a digitally-savvy agency you work with then they should be able to handle this. Use Recruitment Marketing Software — You can use recruitment marketing software like DirectEmployers, PhenomPeople and Ongig to do this. *For more SEO recruiting tips, check out this comprehensive list of free best practices on recruitment SEO. About the Author — Rob is the Co-founder & CEO of Ongig which attracts the best talent faster through next-generation job descriptions (including through Schema.org and SEO!). Yelp, Autodesk, Verizon Digital, GoDaddy, Auction.com and BMC Software are among the early clients of the Ongig SaaS.